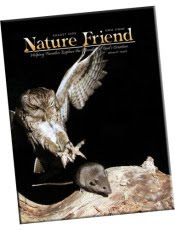 As part of the Old Schoolhouse Homeschool Crew, I received the August and September issues of Nature Friend magazine, and the study guide to go with it. Having never heard of it, I was really excited to get the chance to check out a nature magazine with a Christian worldview. I was surprised to learn it has been published since 1983. When the August issue arrived, my first response was awe at the stunning photography throughout the magazine. I flipped through, and was really intrigued by the Photo Critique section in the Study Guide. 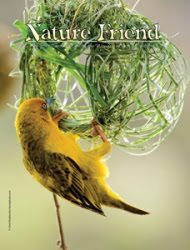 The September issue also contained beautiful photos, and the fall colors discussion in the Photo Critique is great too. But how would this work for my kids? We ended up reading the magazine aloud, an article or two at a time. Once we had read through the magazine, I let it be available to the kids to peruse. They give you permission to photocopy for classroom use, or for within the family, but my kids are not huge fans of word puzzles, so I did not do that. Their favorite section across the board was the "In the Beginning God Created..." feature. In August, it was about Screech Owls, in September they covered Weaverbirds. Other highlights, according to my kids... William, my photographer, particularly enjoyed all the stories about the photos. The stories that start with, "The day I photographed this wild Canadian lynx..." or whatever the subject of the photo is, capture his attention. Thomas particularly likes the "You can draw..." features. Okay, well, the August one had him drawing sunflowers, which wasn't a huge hit (but we have plenty of live examples in our yard), but September had us drawing bears (yes, that was definitely appealing!) One great thing about this section is that they include a page (or two) of reader-submitted drawings from a few months ago. Each magazine also includes some kind of hands-on activity, various other regular types of articles, and word puzzles. There are plenty of opportunities for the kids to interact with the magazine. The Study Guide, available for $2 per issue, gives even more chances for the kids to get involved. This is a fairly new feature -- the first one was published in April 2009 -- and I would definitely get this along with the subscription. For one thing, that is where the Photo Critique feature is. Photo Critique is a few page article that teaches about how some of the photos in the current magazine were set up, with a fair amount of detail. But the Study Guide also includes more word puzzles, some research suggestions, a writing lesson, and lots more photos. I was very impressed with the Study Guide. This is a very nice magazine, available for $36 for one year (12 issues). And did I mention that the photography is simply beautiful?